Why is water one of the, if not the most important health food that your body craves?! 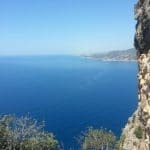 How much water do we need? It’s summer, so some extra attention to hydration! 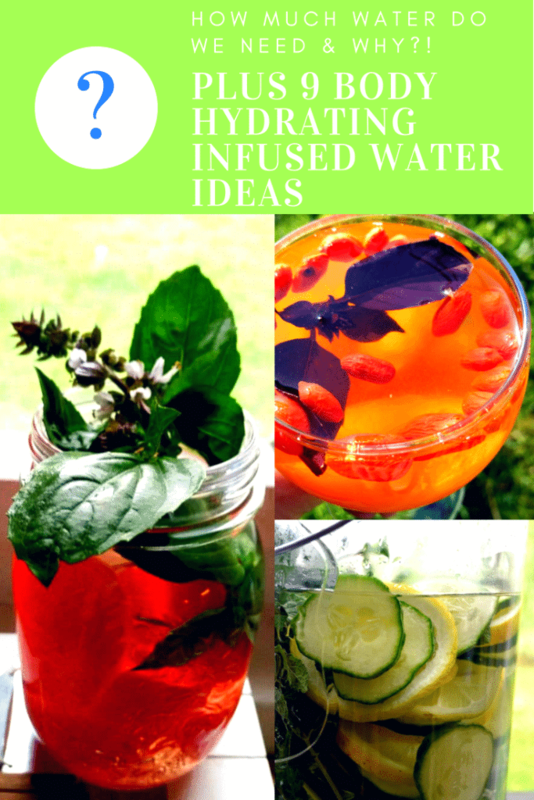 I have some delicious body hydrating infused water ideas for you to make sipping it easy. We can go without food for quite a while, but that is not the case without water. Water is needed for many many functions in the body. Our bodies are made up for the most part out of water and all bodily functions are related to water. That is why being dehydrated robs us from the inside out. That sound serious and it is. Water is such a big part of our overall functioning. It is the biggest part of our blood and lymph fluid. When dehydrated, our blood gets thicker and is not able to transport the nutrients and building blocks where they are needed. Our lymphatic system is necessary for the process of detoxification and there is about 4 times more lymph fluid in our bodies then blood. Who knew!? I didn’t. The difference is that our blood circulates thanks to the pumping of our harts, our lymph fluid gets going by movement like jumping on a trampoline or dry brushing. To clean the body from the inside our systems needs a lot pure water. Building up toxins in the body is a direct consequence of dehydration. Toxins can be easily flushed out of the cells and eliminated from the body if there is enough water going around. For optimal functioning we need healthy, hydrated cells. That is the base we build on. Being dehydrated blocks these functions and even kills cells instead of making them flourish. Immediate results are tiredness, headaches and a lack of energy. And no, coffee, black tea, fruit juice and carbonated drinks does not count for water. To process these the body actually needs extra water. Drinking coffee is not and won’t be something that promotes a youthful skin and energetic body. Summertime and working out means even more water needed! By sweating we lose large amounts of fluids, which is not bad because the body also cleans itself through the skin. Lost fluids only need to be replaced. It is quite disturbing to know that about 75% of people are chronically dehydrated. Lot of people just panic when they hear how much water they actually should be drinking and it seems an impossible task. Don’t worry! It is doable and dehydration can easily be elevated. Our bodies need at least 1,25 liters of water ( 5 cups ) for basic functioning, without cleaning, sports and a hot summer day! For optimal functioning this would be 1 liter or 4 cups per 20 kg / 44 pounds of bodyweight. Dehydration can quickly result in headaches, tiredness and a foggy mind. The most and more severe results are not immediatly visible, they come after a while. It is like eating too much acidic food. The body is always trying to compensate and restore where ever it can. The most needed actions are taken and focused on by your body but there is not enough to do it all. The same goes for dehydration. 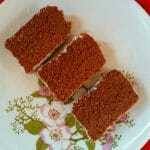 Only the highest needs are served and the rest is left untouched. Not everything at once, divided over the day. More then 2 cups or ½ liter in one sitting is not needed. Every hour a glass is a good measure to start with. 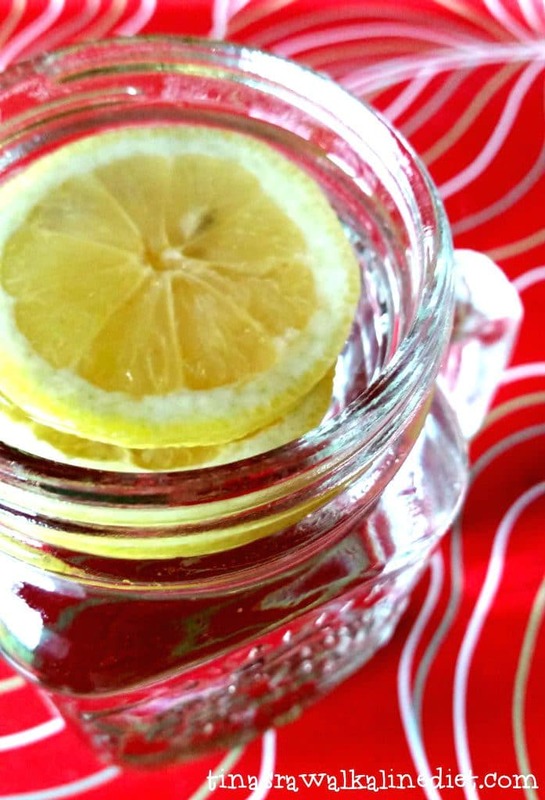 Start with a big glass of lukewarm water with lemon juice to get everything going. Do not drink closer ten half an hour before and after a meal to keep the enzymes undiluted and working. The rest of the day is free game. 10 glasses of water is about 2,5 liters. Add a green juice and a green smoothie and you are being seriously hydrated and detoxed. A big bottle of water on your desk or in the car is a good reminder to keep drinking. The funny thing is that when you do drink enough your craving for coffee and food fixes will diminish. Good hydration of the body will improve the metabolism and keep everything going. You can also make alkaline water by adding alkaline drops. 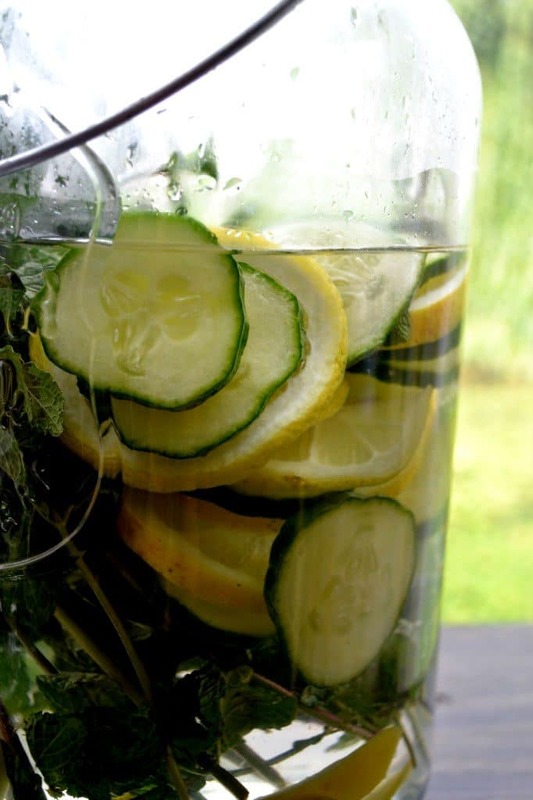 And you also can, espescially in the summer, make your water taste yummy and look beautiful! 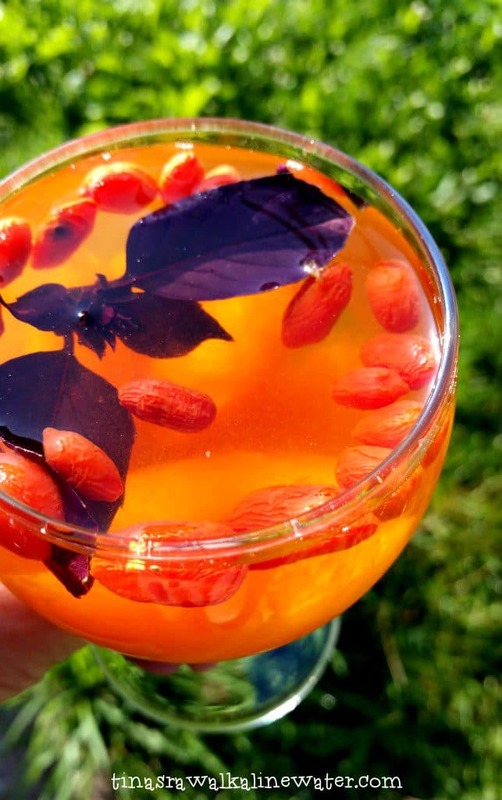 You do not need much to make a fruit and herbs infused vitamin water. 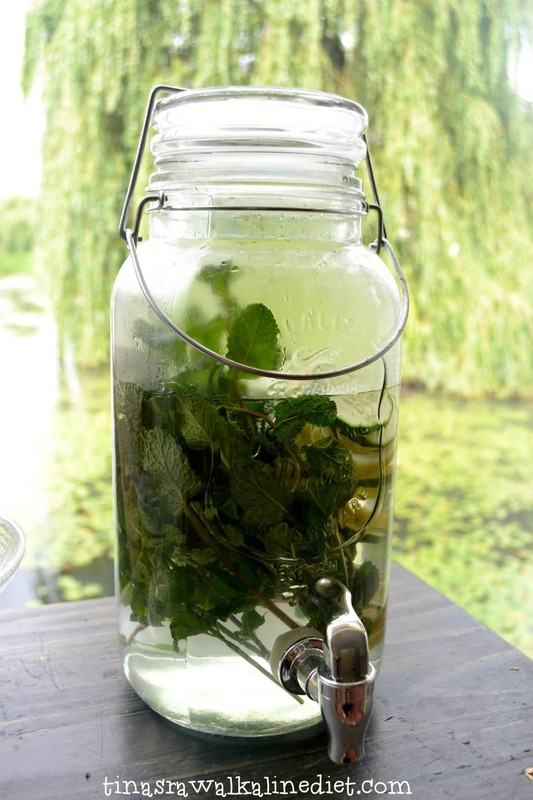 A nice big glass jar or an infused water pitcher is a must. I just love this infused water bottle because it has actual markers on it which makes it so easy to track your water intake. You are adding flavor and vitamins, making drinking enough so much more delicious and pretty. This one is made of cucumber, lemon and mint. A lovely simple combination. I usually put everything in a smaller jar covered in pure water and let it sit in the refrigerator overnight. 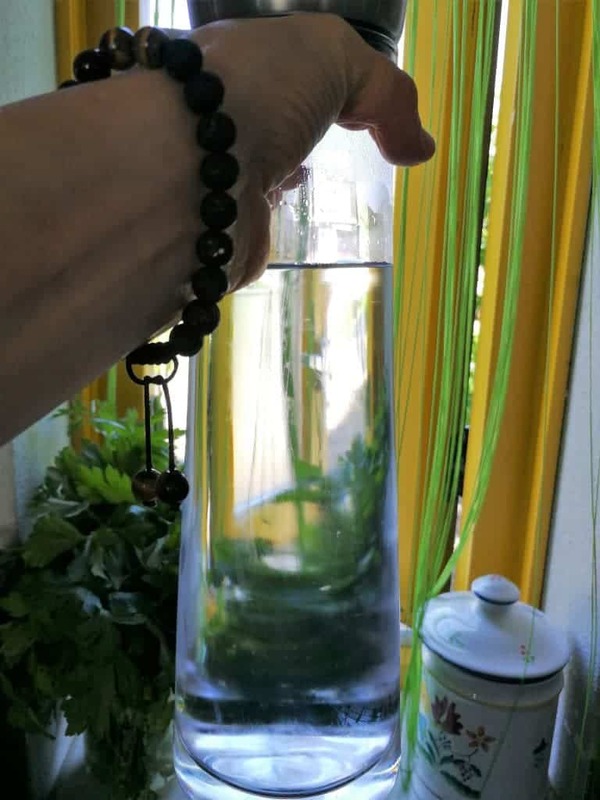 ( big jar does not fit in the fridge ) When we are ready to enjoy the water I pour it over in the big pot adding more pure water and may be some ice cubes. It is wonderful light and you can actually taste all the ingredients you put in it. You can of course eat the remaining fruit or blend it in a smoothie when your water is done. I do have a few more nice combinations for you to try! For more water info read my post about Sole, salt water wit benefits. An ancient way to alkalize the body.